This was a creative workshop designed to celebrate the opening of Walthamstow as the 2019 Borough of Culture in January 2019. The aim of the workshop was to create a workshop that could be delivered in 15 minutes, that will have a high end product, will look beautiful, will be in tune with Walthamstow and honour the London Borough of Culture. For the workshop I designed 3 different lanterns, one for each day of the event inspired by the iconics: Walthamstow Stadium, The Wedlands and William Morris. All the paper lanterns where printed using Shetland and Recycled 160g paper. With the help of Kay and Sue we delivered 900 Paper Lanterns on 3 days. It was great to experience how families came to do the workshop with us and left proudly with their paper lanterns leading their way. So lovely, what a magical workshop. We enjoyed the simplicity plus achievement. Katherine. 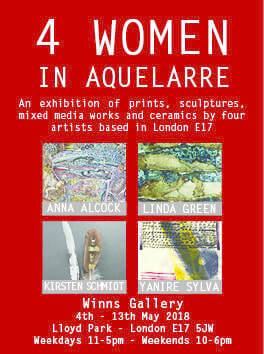 ‘4 Women in Aquelarre’ is an exhibition of prints, sculptures, mixed media works and ceramics by four artists based in London E17: Anna Alcock, Linda Green, Kirsten Schmidt and Yaniré Sylva Delgado. Its inspiration is the idea of the Witches’ Sabbath – famously and disturbingly imagined by Goya in Los Caprichos, and long associated with rebellion and transgression and the reality of persecution. I am presenting to you... "BURIAL PROJECTS"
​In Burial Project or Proyecto Enterramientos, Yaniré Sylva Delgado has made books, prints and ceramics to express her identity, culture and values as an Ecuadorian woman and artist. She has explored issues of guilt and morality and has looked at burial ceremonies and the ways in which we seek peace through closure. Yaniré has made five books. The first presents pictures from burials uncovered by archaeological excavations; the second explores the burial of guilt in Roman Catholicism; the third offers redemption; the fourth opens the project to the public by asking the question: how do you want to be buried? The fifth book incorporates images from the famous Guayaquil Cemetery in Ecuador. “Closure is fundamental in our lives because it allow us to move on. Burial Project has allowed me to grow from the place of pain and frustration so the last piece of work I propose for this exhibition will involve the community, the place where I am now and where I belong. In workshops I will ask the public to create a Venus Valdivia who will represent our growth and hopes in life”. What did you enjoy the most of the workshop? The idea of the workshop was to aloud children to experiment with face expressions and translate the images to a mask on a ceramic tile. The magic is done by them and their creativity, the masks are as original as their author. Love them all! Thank you for taking part on it and to the Sideshow for organizing it. Be Magnificent! Was the consignment for this year Garden Party located in Lloyd Park and organised by Barbican, Walthamstow Council and Create London. The idea behind the phrase is to inspire us showcasing very important artists graduated from Walthamstow College so we can do our best too. I choose Celia Birtwell because I enjoy her designs very much, especially The Besties design for wallpaper. She is a woman who had managed to get known and appreciated for her work, she is a fighter and believes in herself. 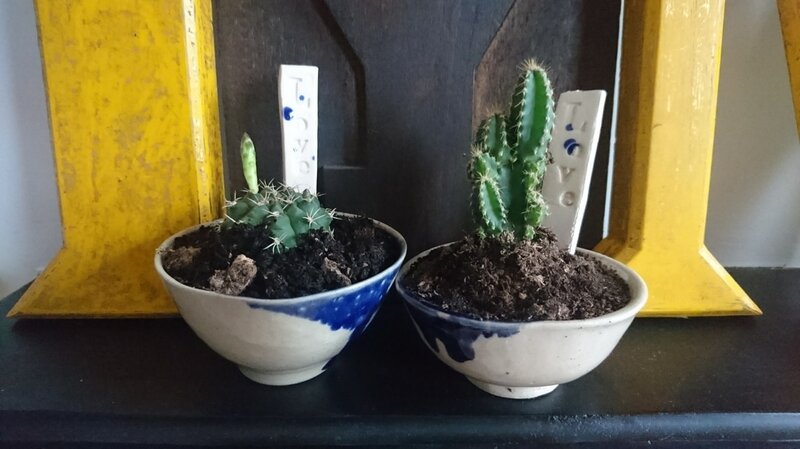 The aim of my Ceramic Workshop was to create a small dish out of clay learning a very simple hand built technique and decorate it using a pattern just like you do when you design a wallpaper or fabric. Two hundred and fifty people attended my workshop, people were very excited and appreciative of the way we conducted the learning process and proud with what they took home. I learned how to organised a workshop for 300 people, not an easy job believe me. I learned that help is there when you ask for it with kind and generous attitude. I learned people are very empathic. Like all the wonderful things in life I didn't do it alone , thank you to my volunteers: Anna, Claudia, Olivia, Kay, Sophia and Sue. Thank you to all who came and took part! "Everyone was so positive, there was no "wrong" thank you all very much"
"Very relaxing and the lady was very helpful in showing us how to do it"
"Brilliant workshop with very clear, step by step instructions. I would definitely up for doing another one"
"My daughter really enjoyed rolling out the clay. Great craft activity and great guidance"